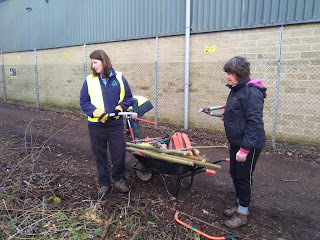 The blog of the Sustrans Volunteer Rangers in the White Peak. 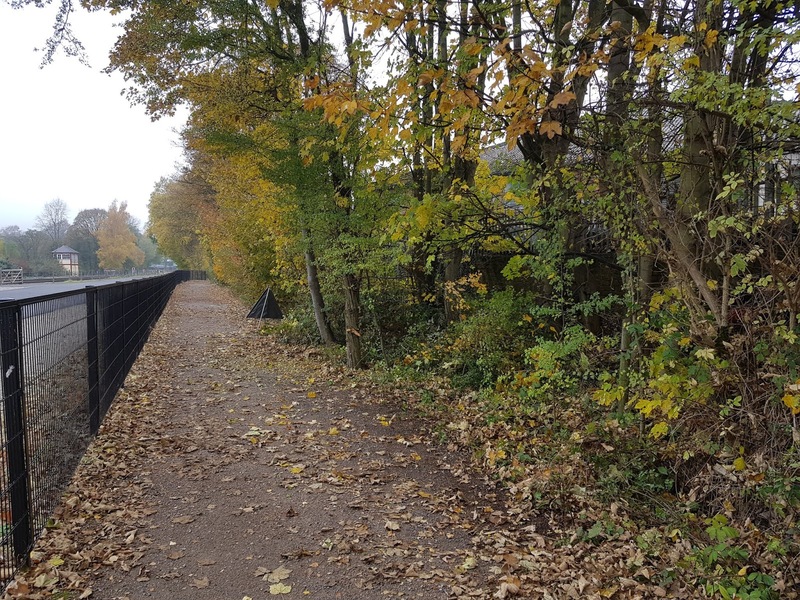 Our area contains traffic-free cycling and walking trails, including the High Peak Trail, the Tissington Trail, the Manifold Track and the Monsal Trail, as well as various on-road cycle routes belonging to the National Cycle Network, in particular Ashbourne to Etwall. We ride these routes regularly, notifying Peak Park or Derbyshire and Staffordshire county councils of any problems. We also sign the trails which are parts of the NCN. 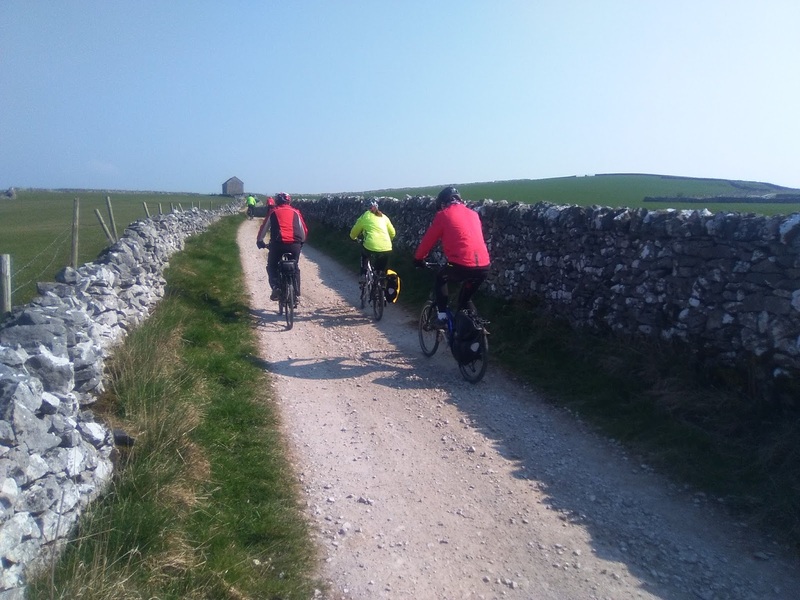 As the pictures below confirm, our April work day was a pleasure to undertake as we were cycling in the White Peak with glorious sunshine and lovely blue skies. 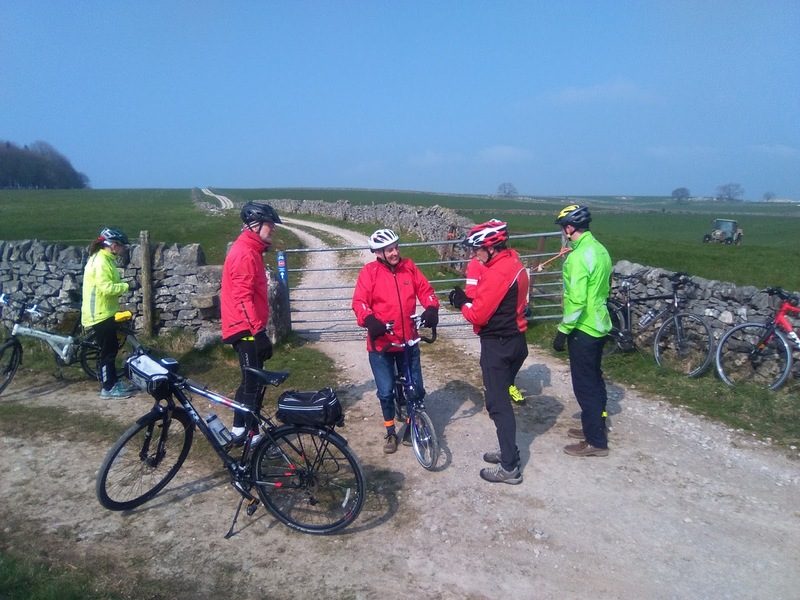 Route 548 runs from Hartington to an intersection with Route 54 on the High Peak trail, close to Minninglow hill fort. 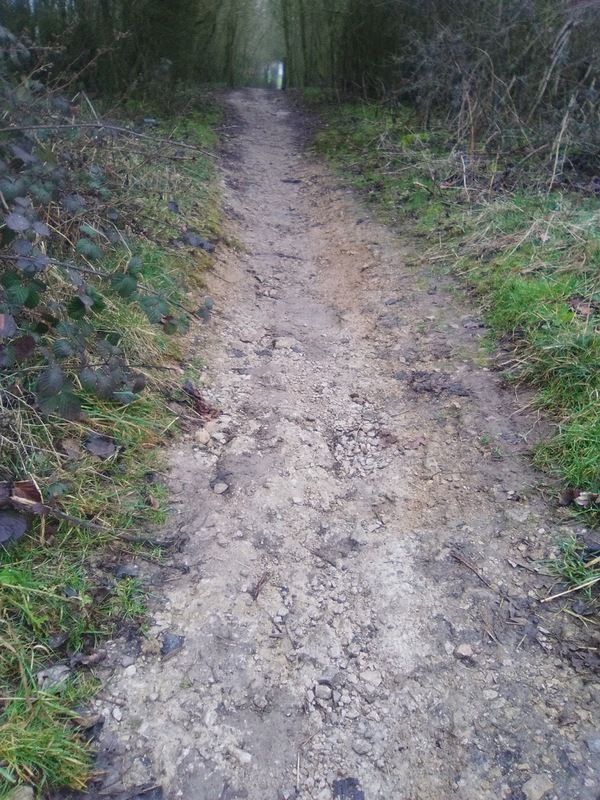 Significant sections are on gravel surface but should be reasonably safe for most riders to cope with. The views out across the White Peak area are unforgettable and breath taking along this route. 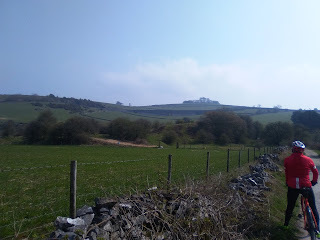 The iconic view of Minninglow hill fort in the distance. 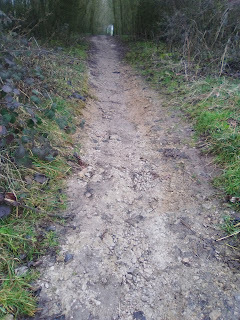 It is accessible from NCR 54 by means of a concessionary footpath. Something I really must do one day as I have never been up it. 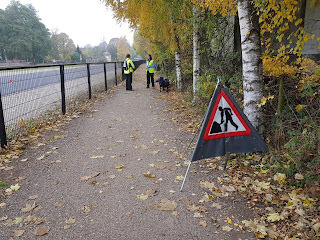 We also took the opportunity to put a number of new signs into place, both on NCR548 and the High Peak Trail (NCR 54). I think we can all feel very pleased and proud of what we have achieved today. 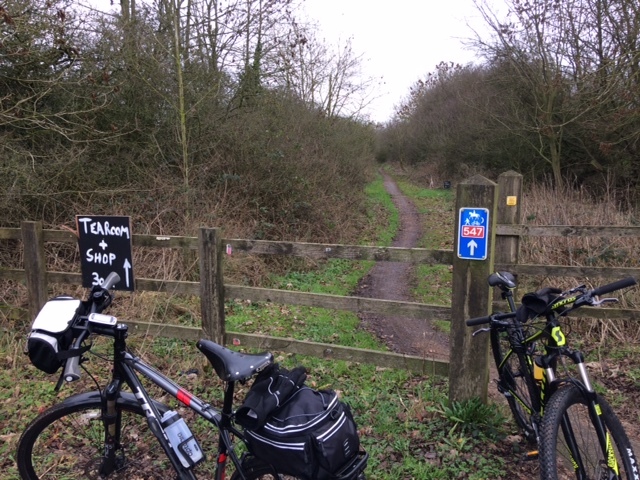 This part of the National Cycle Network is certainly of a higher "signed" quality after our work day today. All the more so because Clyde (who else) found a stash of (54) and (548) stickers that enabled us to link NCRs 54 and 548 with each other using additional green ways. Well done Clyde - we really have missed you. 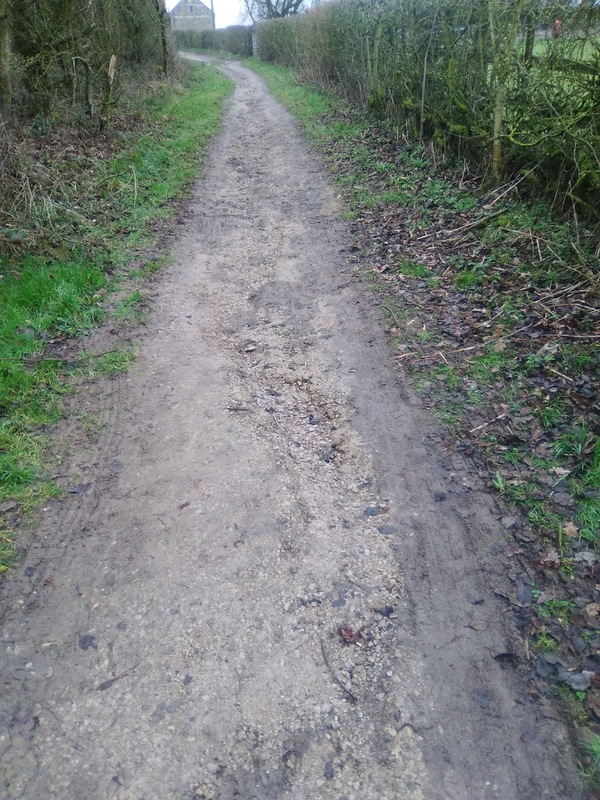 In response to an email received from a user of NCR 547, close to Carsington Water we used one of our recent work days to go up and have a look at the condition of the track from where it starts on the B5035 down to where it links into the drive into the Carsington Water Visitor Centre. 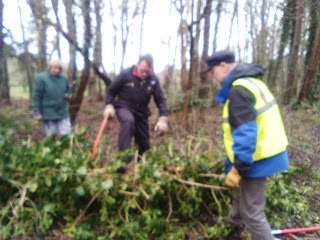 Andrew and Maldwyn confirmed that the initial part of the track (behind the Pudding Pie cafe) was very overgrown and unlikely to be used by cyclists in its current state. They reported that the scale of the problem was such that it would take our small group several work days, even with a good turn out to resolve the problem. I tried to ascertain who has ownership of the land and in that process formed a useful liaison link with Severn Trent's Carsington Water Ranger Group. 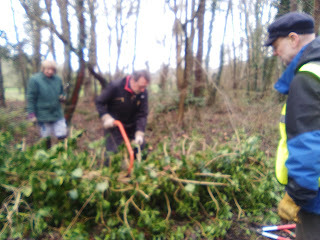 Without too much persuading they volunteered to apply their own full time and volunteer ranger groups to help sort out the problem for us. 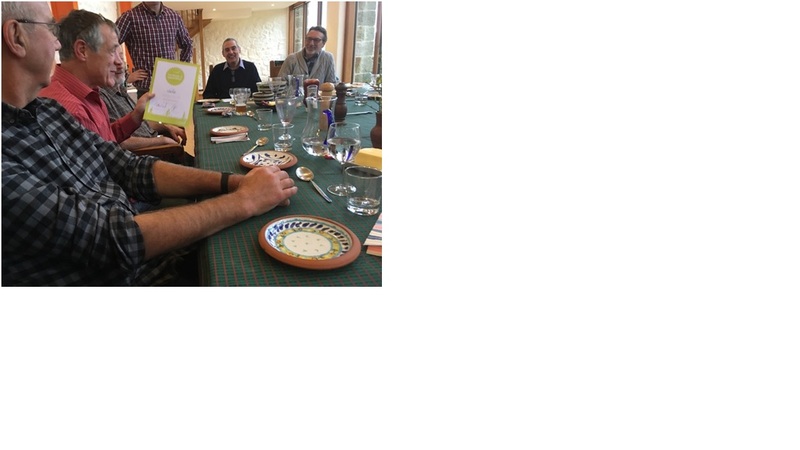 John and Chris have been excellent and we are truly indebted to them for the work they have done. 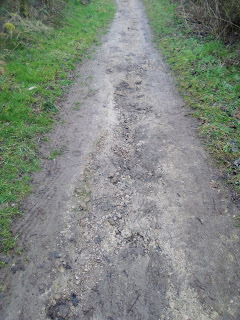 The picture below shows the state of the track a bit further down the hill before they started to clear it. And this is it now! Having been up to look at the transformation this morning I am delighted to see plenty of fresh bike tyre marks along the track, which is now visible. Andrew suggested there be a sign at the B5035 indicating it is 3/4 mile from there to the visitor centre. I have ordered that and as soon as I have it I will go and affix it so as to complete our maintenance of that section at least. Sadly, more maintenance work is required further down the track. Water is running down the centre to form a gully, as shown by the pictures below. I don't think it is critical to repair this immediately as it is certainly still rideable for all but the most timid of riders. However, I think we need to add it to our list of work for monthly work days. Is it beyond our experience and capability? I think we will need to build in some drainage baffles to divert water off the track at regular intervals, as well as putting down a lot more stone. I will try and get Seven Trent Rangers to help us complete that work. Today we have had a really useful work day supporting Groundworks - an environmental charity who are contracted to Derbyshire County Council to keep certain of the trails owned by the council managed and maintained. 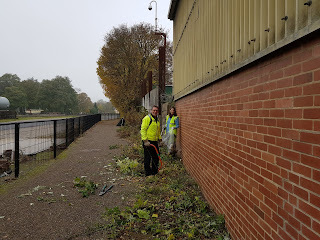 The work today focussed on NCR 680 in the old Rowsley sidings. 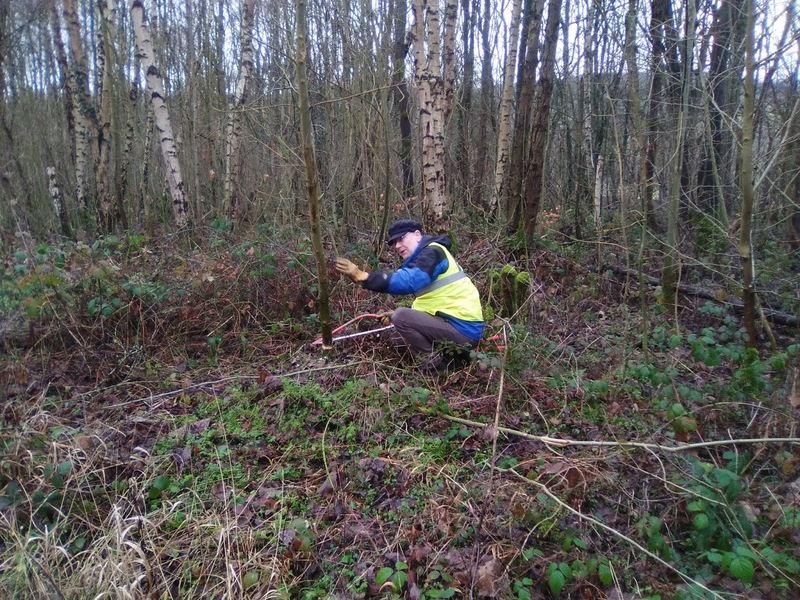 David (G) attended the first of the scheduled dates last monday with his friend Jackie, but this week there was a fantastic turnout of White Peak volunteer rangers, together with some of their partners coming along too. David and Catherine, Maldwyn (+ Karen) and David G (+Jenny) were joined by two non-Sustrans volunteers (David & Martin) as well as the Groundworks regional co-ordinator, Marion Farrell. 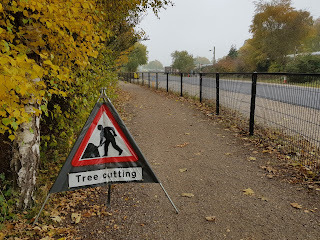 The aim of this work is to cut back the vegetation at either side of the cycle track so as to ensure that it does not impinge upon, or hamper cyclists as the ride a long it. 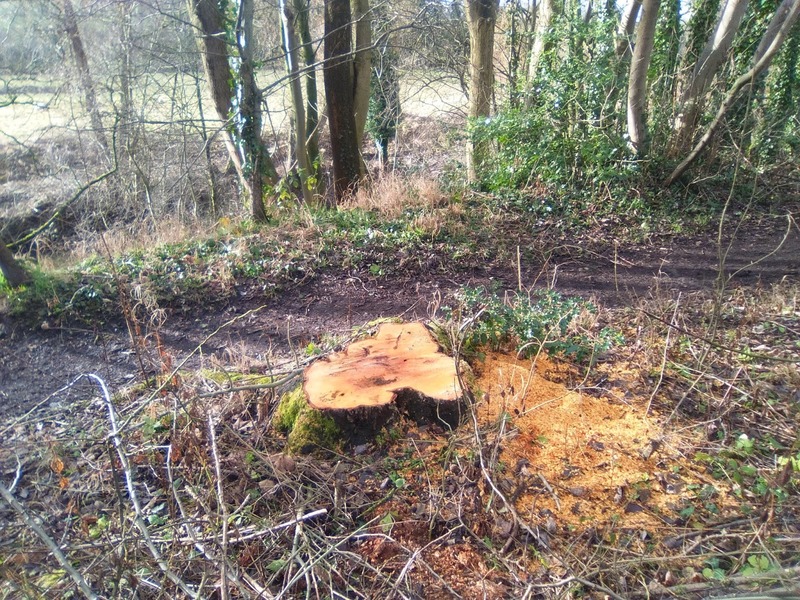 There is a real mixture of small trees that have started to thrive alongside the track since it was created and without a strong cleanse the track would soon become more difficult to use. 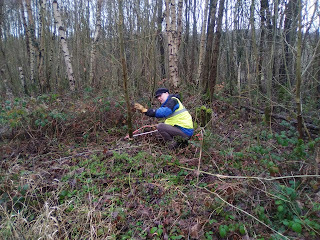 Work has to be done in the winter months, and before bird nesting becomes an issue that would prevent such work. Marion gives full training to the rangers and provides all of the specialist tools required (including chocolate hobnobs). 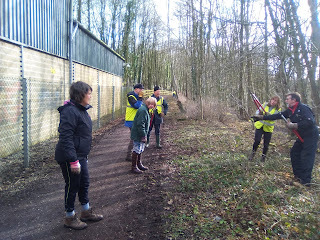 She has a vast knowledge about the woodland habitat and was able to show us how to identify our ash from our oak, willow from alder and blackthorn from sycamore. 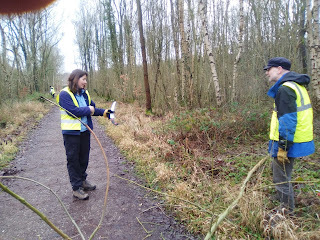 She was able to show us examples of where ash die back has started to affect the young saplings, plus loads more. 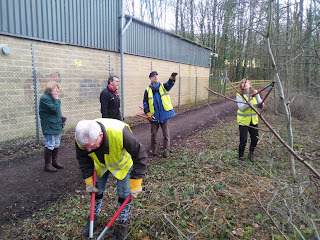 Apart from the trackside saplings we did have one or two bigger challenges, but all taken on with great gusto. Must have been the hobnobs! Maldwyn had just returned from a weekend of deep sea survival traing and I think his enthusiasm came from having been in a confined life raft for a few hours too many. He was a machine that onlookers could only marvel at. Well done Maldwyn, but Marion did n't want that one down! In a complete act of spontaneity we went up Woo Dale on our usual sunday morning ride today. The sun was shining and although it was a raw wind, the skies were lovely and blue. 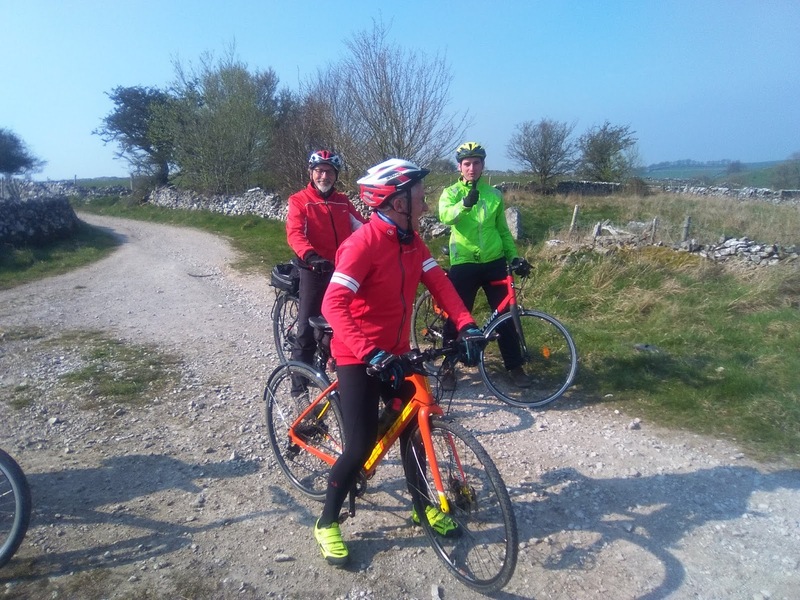 It was a great day to be out in the Derbyshire Dales. Having battled our way into the wind to the end of the Monsal Trail, the usual options of taking the rough track up to King Sterndale, or risking our lives on the busy A6 for a little bit longer and taking the road up to Cowdale, all seemed a bit familiar. So we opted for Woo Dale. It is ages since I have been up there and had forgotten just what a lovely dale it is. The gradient is modest, and heavy going after a night of high rainfall. With a nicely structured path of Topeak it would make an absolutely fantastic route, with the sides of the valley gently wrapping around the track along the bottom. 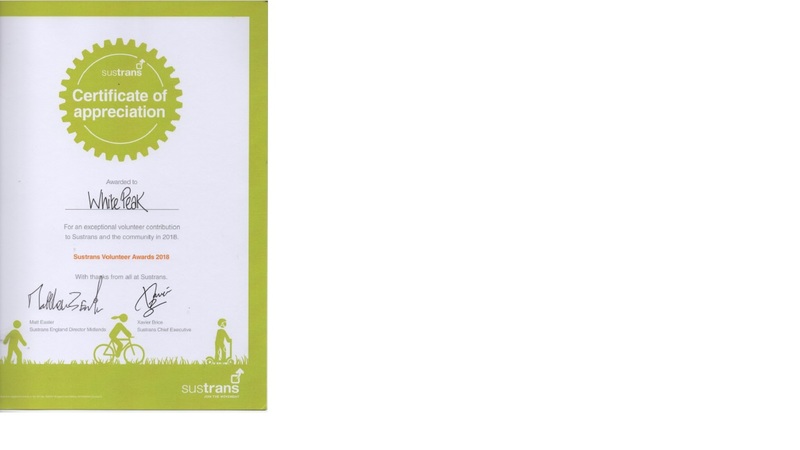 I still can't really understand quite why there is so much opposition from Natural England to it becoming part of the Sustrans network. There are other dales of a similar type in the Peak District where paths and bridleways run down them without too much apparent harm being done. 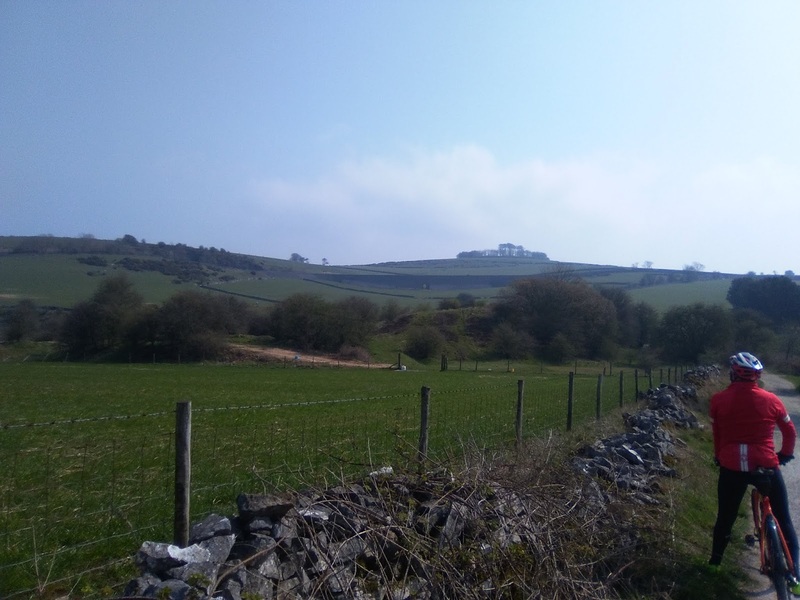 There are no active plans at the moment to revive the ambition to make a permanent link between the Wye Dale car park (Topley Pike) and Buxton. 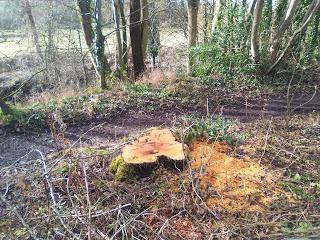 It is not a priority for Derbyshire County Council to backfill the position vacated by Claire O'Reilley and hence there is nobody to actively take forward plans to get a route finalised through Woo Dale and the funding to have it built. Alternative temporary routes are far from ideal. The route up Woo Dale would be absolutely spectacular if travelled in either direction. We should not lose sight of how the creation of a permanent link would so significantly enhance the benefits of the White Peak Loop, and NCR 680 in particular. However, for now at least we can only hope that something will change to make it become a reality. 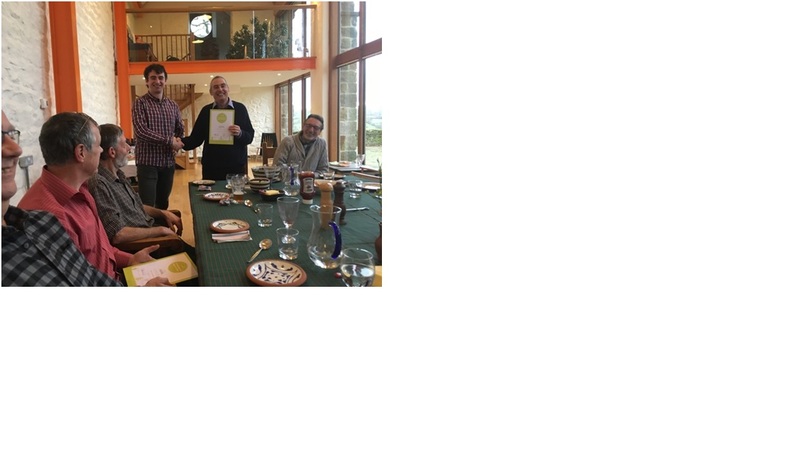 At our Christmas social event our regional volunteers' manager, Tom, presented members of the group with two Certificates of Appreciation. 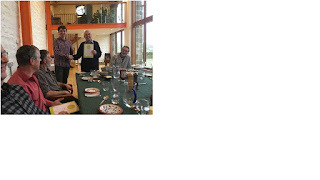 The first was to Clyde for his tireless effort and commitment over many years. Here is a very worthwhile project which is progressing in the West Midlands, the details of which have been sent to me by Bob Cooper who, many of you will remember, has worked with us on some of our workdays. It is a greenway which, when complete, will replace a stretch of National Route 5 which currently goes mostly over minor roads. 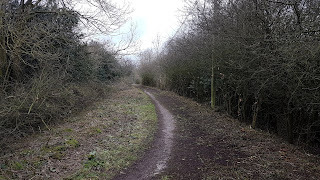 It uses the track bed of an old railway line between Brownhills and Pelsall Common. A lot of work needs to be done to clear and drain the site, and this is already well advanced. The remarkable thing is that all the work which has been carried out so far has been achieved by volunteers, and materials and equipment have been bought from funding which has been won from successful bids made by the group. On one occasion, a JCB was used to do some clearing and earth moving; even this was paid for at a discounted price and the driver was a friend of one of the volunteers! Maldwyn and I met with Marion Farrell of the environmental charity, Groundwork, at Harrison Way, Darley Dale on Monday. 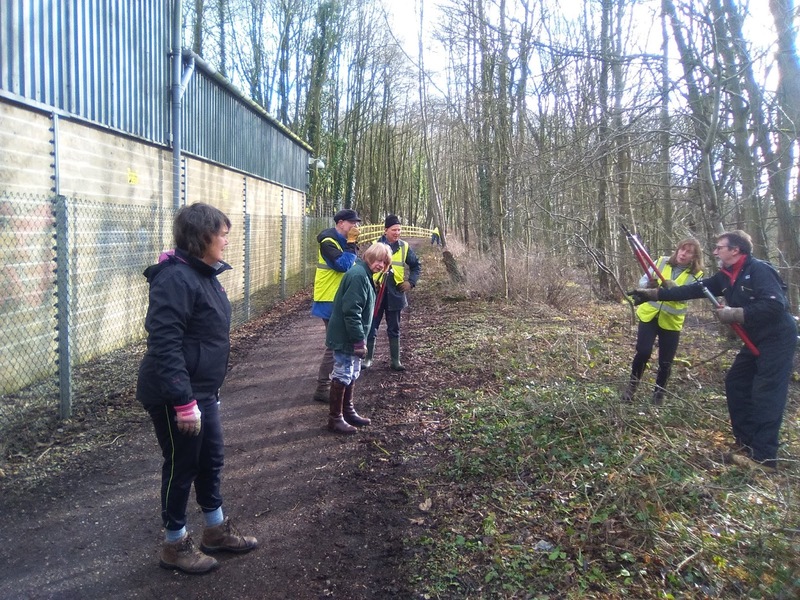 After giving us a few safety tips concerning saws, loppers and rakes, which she supplied, Marion showed us an area where recent tree shoots, nettles and brambles have already encroached onto the Matlock to Rowsley multi-user path which, readers will recall, is still less than 3 years old. Together, we cleared a 100-metre swathe of trail alongside Peak Rail's Rowsley South station car park. Marion also did some litter-picking. 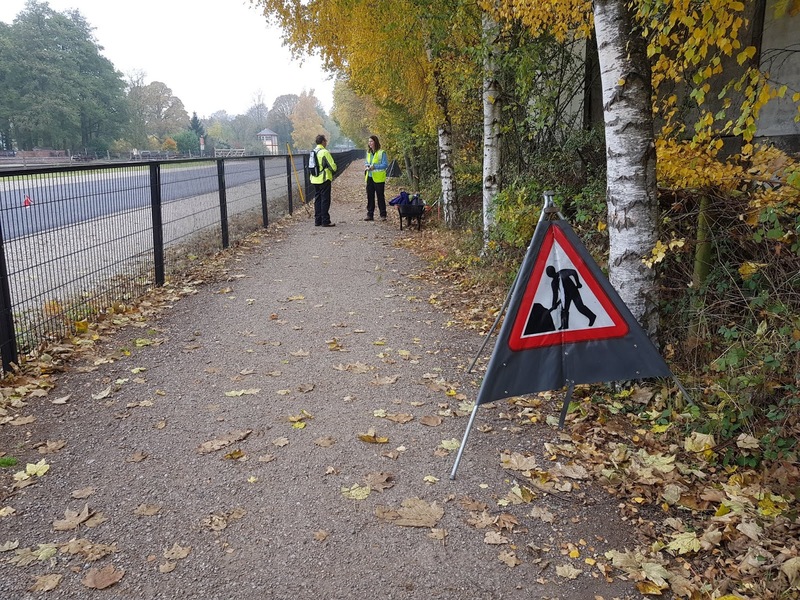 We look forward to returning to this section of path in the not too distant future, to clear some more vegetation, improve visibility and make the cycleway look tidier. In the meantime, it would be great if we can interest users of the trail in forming a local group which can continue this work. 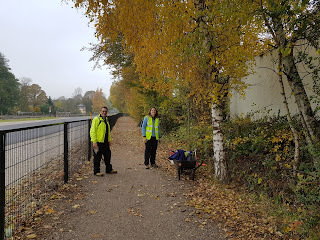 Look how the three silver birch trees stand out in the picture (right), after trimming back a number of small branches. 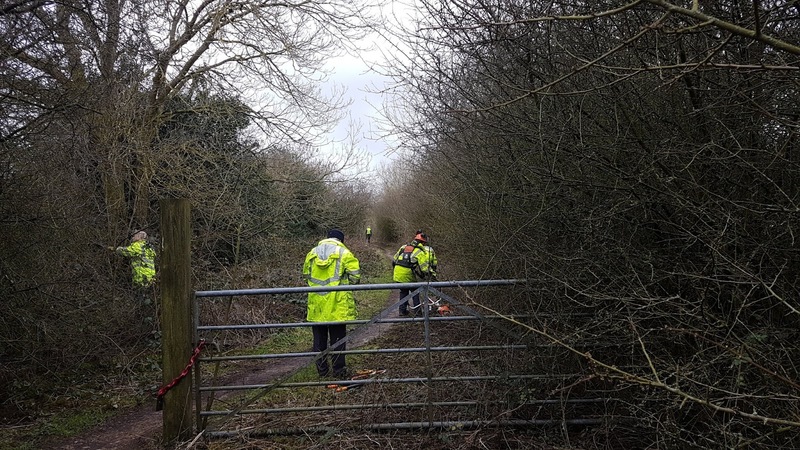 If you know of anyone who would like to take part in this sort of venture along this path (or any other trail in our area), please let me know and I will pass the information on to Marion. To remind you, my mobile is 07855 804451.